Pictured are two aircrafts in the midground of the picture, one is in full view while the second is only half shown. There is a figure in the distance next to the fully pictured plane and three figures in the foreground, one standing with a shovel and two squatting on the ground with equipment surrounding them. There is part of a tent pictured along the left side of the photo with equipment around it. 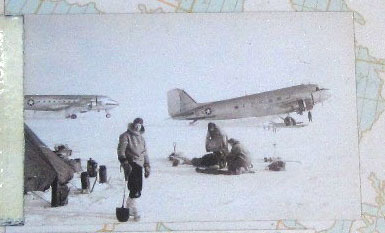 U.S. Air Force, “People working at Airfield with Two Planes in Midground,” Exploring Greenland, accessed April 19, 2019, http://exploringgreenland.org/items/show/33.